HEVC encodes video with significantly higher quality than AVC. Therefore, if it possible, people give preference to HEVC codec videos playing of course. 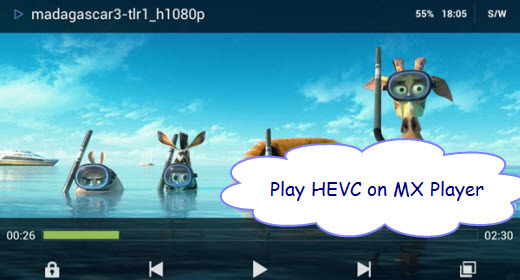 Namely the video you are watching or downloading may precisely be encoded with HEVC For MX Player. Thus a powerful HEVC player is in demand greatly for better video enjoyment on Mac iPhone iPad and Android devices. The playback of a particular video depends on your device’s hardware also. Don’t expect to play x265 coded videos on a very cheap/old Android device using MX Player! The player supports hardware acceleration. This means that the player can make full use of your device’s hardware (along with software) to perform various playback related functions using HW+ decoder. You can always select your decoder using the HW/SW decoder icon present at top right corner of the screen within the player. The player fully supports multi-core decoding. This means that the player will make full use of your device’s multi-core processor for decoding purpose. This feature can be considered very useful for those who have bought a quad-core mobile device just for Messaging, WhatsApp, Facebook and YouTube! The player also allows you to zoom in (upto 300%) and out across the screen of your device. The player also supports subtitles with format of .idx, .sub, .srt etc. You can also set the speed and synchronization of the subtitles. You can also set your own aspect ratio within the player. The supported aspect ratios are: 1:1, 4:3, 16:9, 16:10, 21:9 (2.33:1), 64:27 (2.37:1), 2.21:1, 2.35:1, 2.39:1, 5:4 and custom. If you’d like then you can also set sleep timer within the player. Feel free to visit the developer’s page of MX player if you’d like to download codecs for ARMv7, ARMv7 NEON, ARMv5, ARMv6 AFP, Tegra3, ARMv6 and x86 based devices. MX Player comes conveniently packaged with tons of video codec making it a go-to app for anyone looking for a do-it-all solution for playing a wide variety of video formats and H.265/HEVC is included. What’s more, some guys may also have the issues of importing H.265/HEVC files to MX Player for watching. Once upon a time I had a field day downloading HD movies without bothering about the size of the files but now that Etisalat has long shut down that service, I have reverted to watching my data consumption again. I now focus on downloading HEVC formatted movies as they come in high quality while keeping file size really low. Unfortunately not many android video players out there support this format. MX Player being the best android video player out there supports this format by default BUT unfortunately it lags on some devices. To fix the lag issue simple go to Settings >> Decoder and click on CPU Core Limit. For dual core devices set it to 2, quad core 4 and octa core 8. Also tick Use Speedup Tricks and then reboot your device. Now when playing files like HEVC or MKV which lag, simply switch the decoder from HW decoder to SW decoder. HEVC/MKV files should now play well without lags. Also do please note that switching from HW decoder to SW decoder will consume your battery a lot faster as SW decoding makes use of the CPU while HW makes use of the device’s GPU. Increased CPU usage = Increased battery usage. Please let us know if this works for you or not. Thanks. Enjoy watching the latest hot movies or videos on MX Player? Especially for H.265/HEVC files, I have to admit that it is so enjoyable for us to watch the high definition movies with our family members. Sorry for the situations mentioned above and a best method of watching H.265/HEVC files on MX Player with no issues is offered here.If you tried all the ways above and still can’t play H.265 videos with MX Player, this way must be effective. You can re-encode H.265 video to H.264 video for MX Player playback. 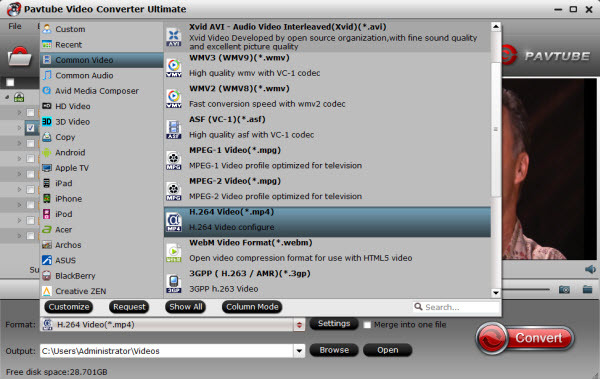 With Pavtube Video Converter Ultimate, you can easily convert H.265/HEVC video to H.264/AVC files. This video transcoder can transcode H.265 MKV, H.265 MP4 and other H.265 files to H.264 MKV, H.264 MP4 for MX Player playing. It even can convert 2D video to SBS 3D for Kodi 3D playback. Pavtube Video Converter Ultimate is also a Blu-ray Ripper that can bypass Blu-ray AACS, BD+, up to MKV V61 and MKB V62 to convert H.264/AVC and H.265/HEVC Blu-ray to H.264 MP4/MKV for MX Player. Note: For people who are running on Mac OS X, please get iMedia Converter for Mac. Now please follow me to play H.265/HEVC on MX Player in three simple steps smoothly. Launch the HEVC to MX Player Converter. Drag & drop HEVC/H.265 Files to the program directly and your files would be added instantaneously. Or you can head to the “Add” button to locate the HEVC/H.265 Video Files you want to add. Click the Format bar and on the output list, we recommend you to choose the Common Video -> H.264 Baseline/Main/High Profile (*.MP4) as the target format. Of course, you can also set DivX, MOV, WMV, MPEG-2, etc as the output format as you need. Click “Settings” button; you can adjust video and audio settings, including codec, aspect ratio, bit rate, frame rate, sample rate, and audio channel. To down-convert ultra HD 4K to 1080p HEVC/H.265 Files for easier playback in MX Player, you just need to adjust video size to 1920*1080. 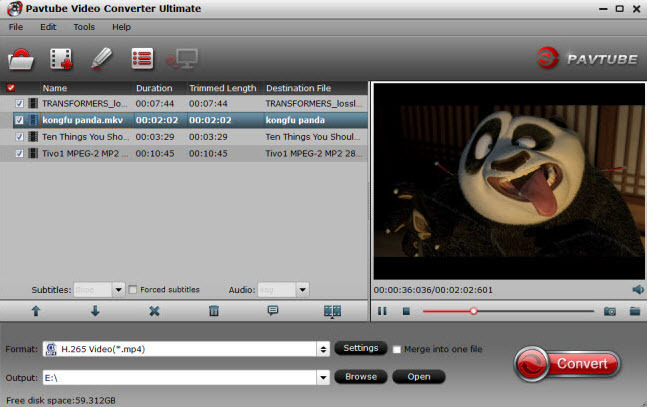 Hit the “Convert” button to let this smart HEVC/H.265 Files converter start encoding HEVC/H.265 Files to MP4. When the conversion is done, you can play the converted HEVC/H.265 Files in MX player without hassle. With the faster conversion speed and the high quality preserved, it’s wonderful to enjoy H.265/HEVC files on MX Player with others!